I did my first implementation using soundcard in 2012. It started at Muffwigglers video synthesis forums – Dave Jones and Lars Larsen were both kind enough to offer their help with basic concepts. I continued working on the patch and used it often in my own artistic work – installations, theatre projects and AV performances. I planned to share it for quite a while, but never really did it :) . 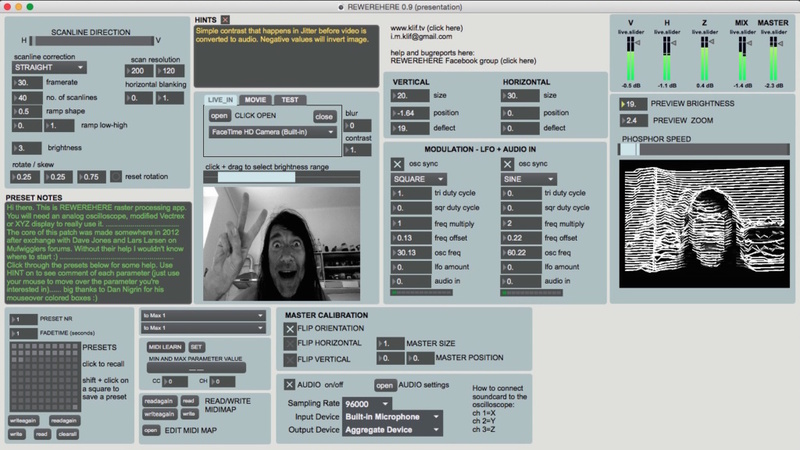 The recent rise of instruments, apps and libs that control analog oscilloscopes and XYZ displays from computer by Jerobeam Fenderson and Hansi Raber http://oscilloscopemusic.com/ , Derek Holzer https://github.com/macumbista/vectorsynthesis and Ted Davis http://www.teddavis.org/xyscope/ gave me enough motivation to finally clean my patch and release it. It is constructed primarily as a performance instrument so MIDI controller is essential for the experience. Here is a demo of a recent version of the patch – live recording of me going through few presets and simultaneously messing with the parameters on Korg Nanocontrol. external soundcard (you will need 3 output channels). DC couple card will allow you to move the image around the screeen. WIth AC coupled soundcard, image will always drift to the center of the screen – this is not necessarily so bad, it makes life much simpler sometimes because you don’t have to play hide and seek when the image is way offscreen (you’d be surprised how often this happens). Most of the cards will be AC coupled, there are just a few brands that make DC coupled ones (I use MOTU). MIDI controller – it will work without it but this is really about live performance.